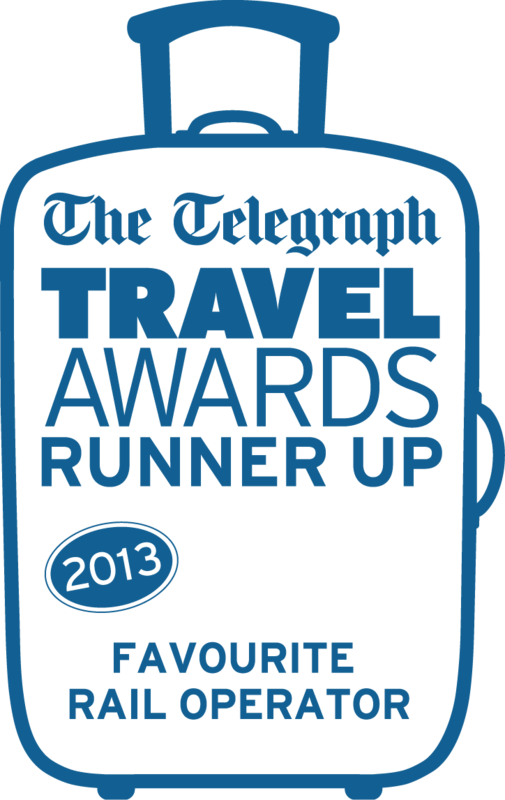 2014 was a very special year for Ffestiniog Travel as we celebrated our 40th Anniversary and we would like to take this opportunity to thank you for your continued support and hope you will continue our journey with us by joining one of our escorted tours or being an FT tailor made traveller during 2015. One of the major highlights for us during our milestone year was the celebratory 40-day 'Around the World' escorted tour which circumnavigated the Northern Hemisphere by train, travelling through Europe, Russia, Mongolia, China, Canada and the USA. Our team of expert travel consultants work hard to combine great rail journeys, comfortable accommodation and interesting sightseeing tours to create memorable rail holidays. Sheryl went that step further in bringing together a 40-day itinerary that travelled through three Continents and scheduled in some wonderful sightseeing en route. We place a lot of emphasis on quality and customer service and are always gratified to receive positive feedback. 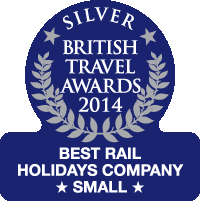 We were delighted to be awarded Silver in the British Travel Awards 2014 for Best Small Rail Holiday Company. This was entirely due to the number of votes cast in our favour and we thank you again for your support and appreciation of our product and services. It was the icing on the cake during our birthday year! We enter 2015 with a lot of optimism and relish the opportunity to introduce some multi-departures on our popular rail holiday destinations. It is fitting that Switzerland continues to be one of our favoured escorted and tailor made choices as FT’s very first overseas escorted tour was to Switzerland in October 1974 when nearly 70 people travelled with us. Our 2015 escorted tour programme will travel to the Swiss Alps eight times next year including our annual tours Christmas & New Year in Switzerland; Snow on the Alps; 2 departures on our Summer in the Alps, Swiss Alpine Holiday and Florence, Lake Garda & Swiss Alps tours and we even stay in Switzerland during our Rhône from Sea to Source tour. Romania continues to excite those who want to explore a relatively untapped area of Europe. Our Mountain & Forest in Rural Romania tour has three departure dates in 2015 but as this tour is limited to a group of just 12 people it quickly fills up so don't leave it too late to book! Our Moldova & Eastern Romania tour offered an interesting alternative and places filled quickly as this too is restricted to a group of 12 due to the popular rural ‘homestay’ accommodation included in the itinerary. We are repeating our 'Pushing the Boundaries' tour into Kosovo, Macedonia & Albania which is proving to be an appealing choice of destination. For the rail connoisseurs among you Germany features highly during 2015 as it is famous for its steam operated narrow gauge lines in the former East and the many preserved lines in the West. We continue to visit the Harz Mountain Railway (HSB) during its Winter Gala and Autumn Gala and we have two departures on our Eine Kleine Dampfmusik tour that brings together the best of Germany's steam heritage. In addition to our two tours of India in early 2015 other long-haul tours include New Zealand, Japan, the US and Colombia & Ecuador. If you prefer to stay closer to home we visit Scotland, Isle of Man, Isle of Wight and of course Wales. For the more independent travellers our Tailor Made service is a busy part of our business and an enjoyable one as we work closely with customers to ensure every aspect of their holiday is right. Don't forget we also provide a ticket only service for both rail and flights. Our experienced and enthusiastic team can offer expert advice regarding routes and fares for any planned journey. Our ticketing department is a one-stop-shop for all your rail and flight ticket needs. Visit www.myrailtrip.co.uk for more information. Wherever you may travel during 2015 we hope it is a safe and memorable journey. 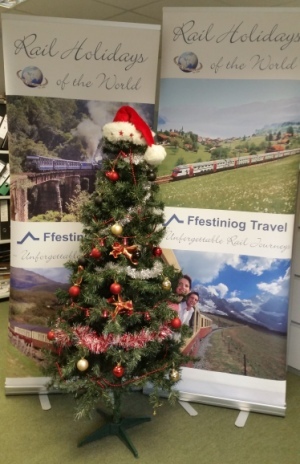 Meanwhile all the staff at Ffestiniog Travel would like to wish you a very Merry Christmas, Happy New Year and unforgettable holidays during 2015!